While much of the Smart Home market is focused on Do It Yourself, there has also been robust demand within the Do It For Me part of the market supported by Smart Home Service providers like Vivint or Comcast Xfinity Home. While overall consumer interest declined in Q1 2017 over Q4 2016, March 2017 saw a significant increase over February 2017, indicating that a combination of spring promotions and increased interest in Do It For Me based on holiday DIY experiments. Q1 2017 Market Snapshot of Smart Home Service Providers show Comcast and Vivint dominating the ecosystem even as overall consumer demand slows compared to Q4 2016. Vivint clearly wins out for the overall consumer demand during Q1. Most service provider customers write reviews soon after they sign up or after a new version of the App has been released. We can see from the graph above that Vivint leads the overall tally of quarterly mindshare but lags a bit behind Comcast with respect to Net Promoter Score. AT&T is still in the mix but has more frustrated consumers than Comcast or Vivint. In March, Vivint saw improvements in their UX while Comcast dropped over the quarter so they they are within 1% of NPS from each other. 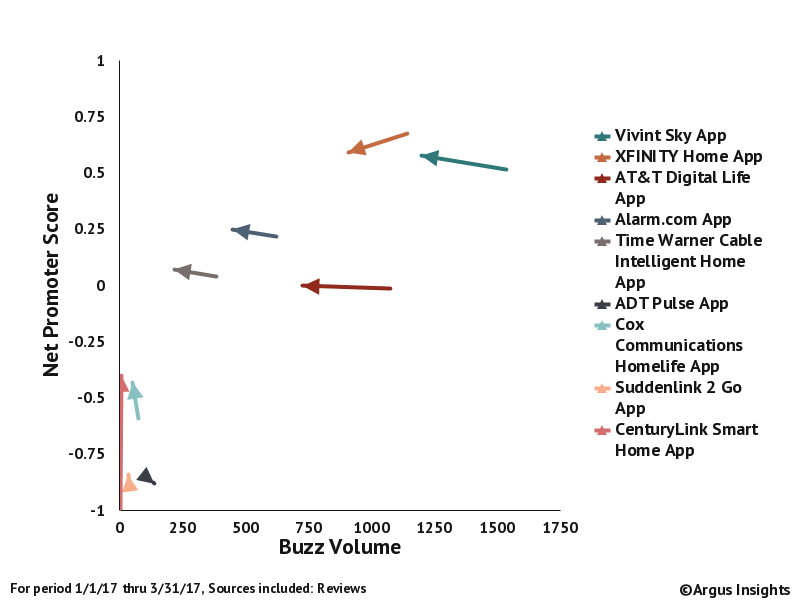 Comparison of how Smart Home customers perceive various usage scenarios of AT&T Digital Life, Vivint Smart Home and Comcast Xfinity Home. When we dig deeper into how consumers report using their Smart Home with their lives, it should come as no surprise that Home Security is the most discussed usage scenario. Securing your home is still the main reason consumers sign up for Do It For Me services though you can see this shifting for Vivint as they list Climate Control more than any other service provider. AT&T customers are clearly grump about their security and entry control experience with Digital Life. Comcast customers are focused on Security almost to the exclusion of other scenarios though Xfinity customers mention monitoring their pets more than AT&T or Vivint customers. Customer service tends to frustrate all consumers. AT&T has the most frustrated consumers whereas Vivint has the most positive view. Customers of Do It For Me tend to value Customer Service in their selection of service providers. While consumers do not mention their experience with Customer Service as much as other topics, you can see a definite correlation between the service provider’s Net Promoter Score and the consumer perception of their customer service experience. AT&T has the most negative mentions of the top three service providers. Vivint has more negative comments than Xfinity but also more positive. Vivint is also the only provider with a net positive perception of the Quality of Customer Service, a surprising outcome to be sure. Of course we have more data behind just this basic analysis. Quotes from consumers on specific issues, comments on the installation process and more, with data going back literally years to assess the impact of changes and new innovations being unleashed on the Smart Home market. You can get access to these tools yourself, using the Argus Analyzer. Learn more by clicking below. Schlage Locks Up Smart Entry Market for Q1 2017	5G Dominates IoT Narrative on Protocols But Why?